Hunter Jumper Stables Directory - Page 2 - O Horse! Breeding, raising, training, and instruction in horsemastership & equitation. Large outside arena & cross country course. Full service facility that offers lessons for beginners thru Grand Prix level. Specializing in hunters, equitation, ponies, and adults. 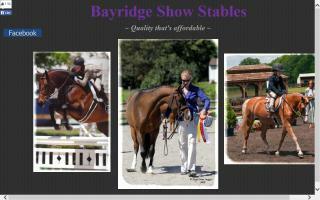 Sales, leases, training, showing, kids' camps, and breeding. Showing, lessons, boarding, and training for the horse person on a budget! Our trainer has shown at many national USEF rated shows, qualifying for many junior medals, pony finals, etc. Contact us for an appointment! Pasture board, stall board, training board, lessons, and training rides. Contact us for current rates. Operated by rider/trainer Daniel Bedoya, JR. We are a full care boarding facility, and our focus is prepping horse and rider for the hunter/jumper ring. Sale horses ranging from low level hunters to grand prix jumpers are available. English riding lessons are offered from beginner to advanced. Horses and equipment provided. Belle Wood Stables is a full-service equestrian center located in a beautiful private setting in central Massachusetts. We offer horse boarding, lessons, horse training, clinics, and quality horses for sale or lease. We are adjacent to acres of beautiful conservation land, which provides miles of riding trails, and our farm is also very convenient to major routes. We foster a friendly atmosphere and an environment in which riders of all levels can progress both competitively and personally. With quality lesson horses and excellent instructors and trainers, we support riders in many disciplines, including hunter/jumper, dressage, and pleasure riding. We welcome you to browse our web site and call for a tour of the facility.